A few weeks ago I decided that I wanted to get into 3D printing. I kept stumbling across posts on Reddit where people were showing off some really cool things they created with their 3D printers so I started doing some research into which printer to buy. In this post I’ll be talking about my research that led me to the Mendel90, my experience of the build process, and also my initial results with the printer. Initially I was looking at the Makerbot Replicator 2 but after reading several reviews I quickly decided it wasn’t worth the $2K price tag. Ars Technica wrote an interesting article that suggested the Makerbot wasn’t any better than the extremely cheap $300 Printrbot Simple kit. One of my friends had also mentioned that I should look into building a Printrbot Simple instead of buying a pre-build printer. Everything I read about the Printrbot Simple suggested that I was a really good value for the money but I was concerned about the long term performance of the wood frame and also the small build area. 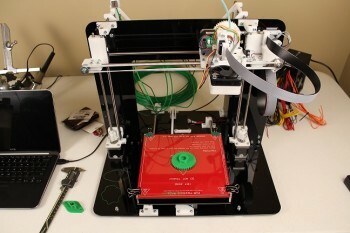 While looking for alternatives to the Printrbot I discovered the Prusa i3 which is an open source RepRap printer. I really liked the concept of an open source design which would allow easier future modifications. While the complete bill of materials is available for the i3 I wanted to find a complete kit to make my first build go easier and not have to worry about sourcing all of the parts. I had narrowed my decision down to 3 Prusa i3 Kits. 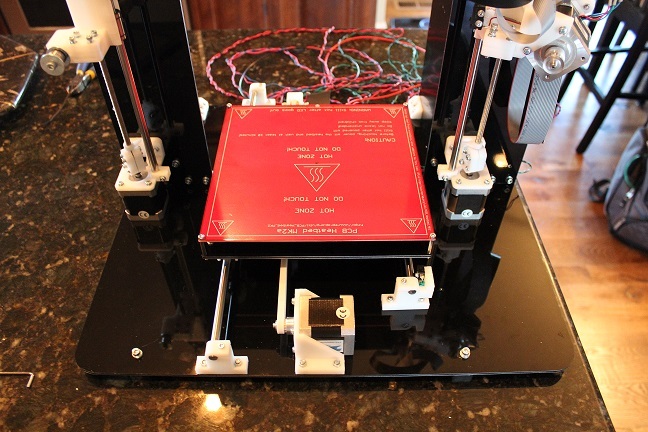 The reviews on the kit from DIY tech shop weren’t the greatest, and there was a post in the RepRap forums that suggested there may be some quality issues with this kit. I liked the kit from Norcal RepRap and the reviews were pretty good but the kit does not include any instructions whatsoever. As a first time builder this turned me away from this kit since I was really looking for some high quality instructions to ensure I could get everything going with very little frustration. The Markerfarm kit was looking like my best option since it had really good reviews and it included some excellent instructions and videos. There was also a lot of feedback in the forums from users who said they were able to get very quick and responsive support from Collin who runs Makerfarm. I almost purchased the Markerfarm kit but again , like the Printrbot , it used a laser cut wood frame. Since I live in a very humid area I was worried that I would have to battle the effects the high humidity would have on the wood. Finally while reading some posts in /r/RepRap on reddit I found a user who suggested the Mendel90 as an alternative to the Prusa i3. It quickly became apparent to me that the Mendel90 was a very well designed printer. 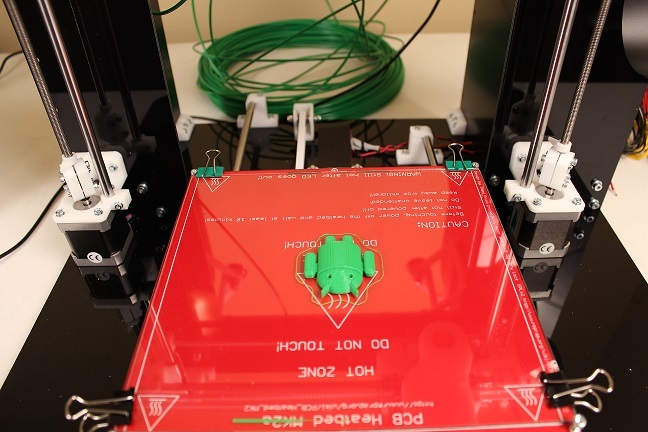 The Mendel90 was designed by Nophead to address some issues with the Prusa Mendel. 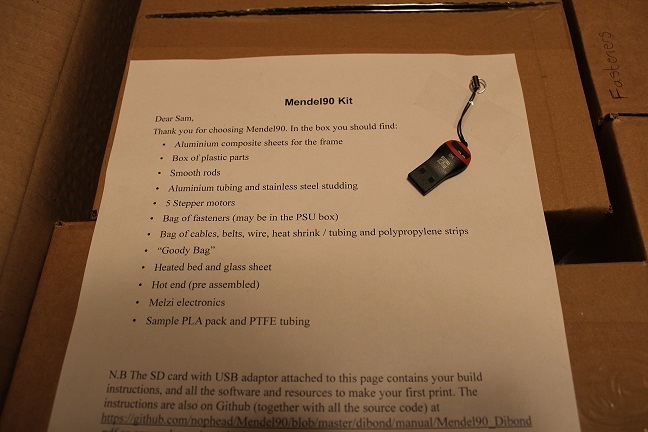 Below are the main things I liked about the Mendel90 kit from Nophead. 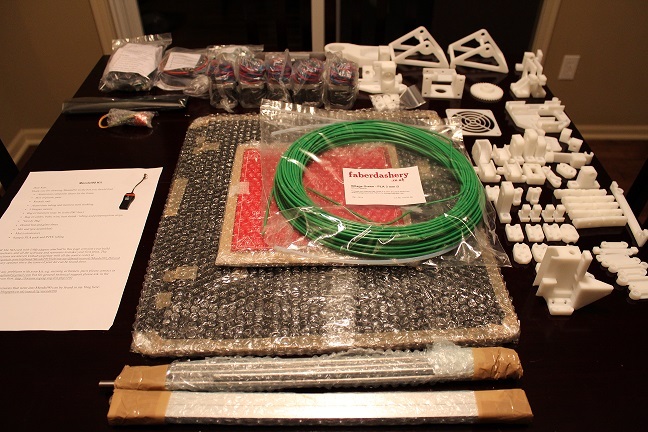 To purchase the Mendel90 kit you must first make contact with Nophead via email, his address can be found on the RepRap forums. After sending an email to Nophead I quickly received a response from his wife Mary who indicated that US kits cost £484 (since they do not include a power supply) plus £60 for shipping for a total cost of £544GBP. She also informed me that it would be about two weeks before my kit would be ready to ship and that they would accept payment in US dollars via PayPal once the kit was ready to ship. Exactly two weeks later I received another email from Mary who said my kit was ready to ship upon receipt of payment which worked out to be $872.14. I sent in my payment through PayPal and I received a tracking number the next morning. My kit was delivered via UPS after only two days which was amazingly fast for an international shipment! Below is a list of everything I purchased for this project. I recommend reading through the manual first to view the full list of required tools and other consumables. You may already have some of these tools or parts lying around your house. All of the parts in this kit are metric so I needed to pick up some metric hex keys since I didn’t have any. It also requires some metric wrenches but I was able to get by using a metric socket set I already owned. Having a pair of digital dial callipers is pretty much a must have for building and calibrating this kit. You can find them available for much cheaper than the Mitutoyo pair but I hate cheap low quality tools since they tend to break and require replacement in the long term. I purchased the security bit set since I didn’t have any pozidriv screwdriver bits and this seemed like the best value option to get some. I also purchased a digital dial indicator that I intended to use to level the bed using a printed bracket Nophead designed but when I mounted this dial I found that the feeler was too short and wouldn’t reach the bed. I haven’t found a solution to this yet but if you’re looking for an indicator gauge you might have better luck with one of the analog gauges with a longer feeler. Nophead doesn’t include a power supply in the US kits (most likely for customs reasons) but he does deduct the price from the cost of the kit. Nophead uses an Alpine ATX500 power supply in his build instructions but this power supply is not readily available in the US. I could have purchased it on eBay but I didn’t want to wait for it to arrive so I decided to go with a good quality Corsair power supply. The most important factor in a power supply for the Mendel90 is looking for one with a single 12 volt rail that has plenty of amperage. You also don’t want a modular supply since it will make wiring much more of a challenge. To be certain I wouldn’t have any power constraints I spent a bit extra on a 600 watt power supply with plenty of amps on the 12V rail. 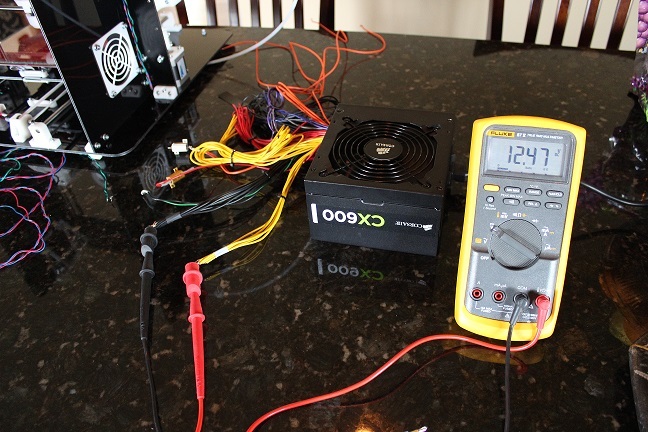 Some users in the forums reported issues achieving maximum temperature on their heat beds with cheaper power supplies. They also reported seeing some voltage droop in the 12 volt rail during operation. I used some regular 10w30 car motor oil I had in my garage for lubricating the threaded Z lead screws, which it turns out is what Nophead recommends. 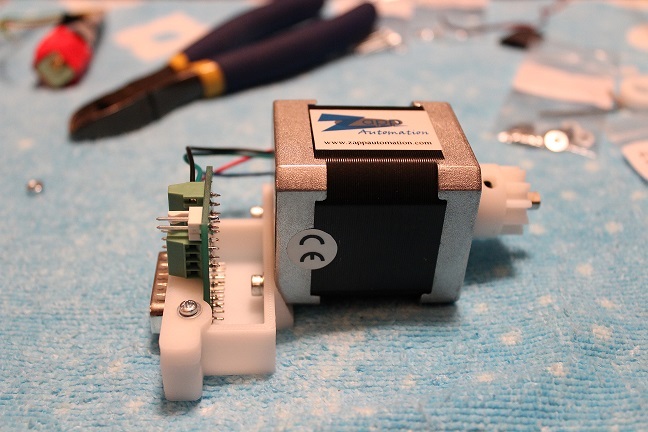 The lithium grease is needed to lubricate the extruder greats but you don’t need much at all. Nophead also lists some lint free wipes but so far I’ve had good results using a damp bounty paper towel to clean the bed. The kit arrived very well packed, the box wasn’t quite as big as I had expected but it was quite heavy. 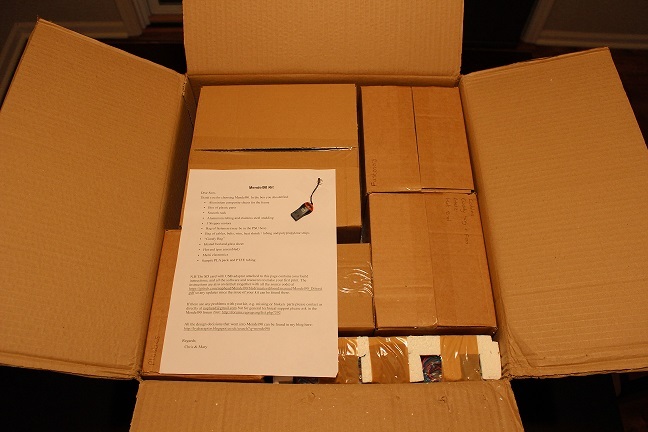 All of the parts were very well organized into individual boxes that were labeled with their contents. 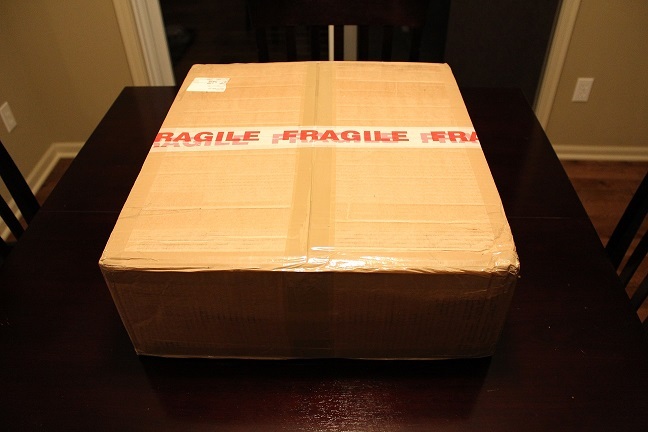 The package also contained a personalized letter from Chris (Nophead) and his wife Mary. Attached to the letter was an SD card with all of the required files and software as well as a really cool USB SD card reader! This really shows the effort that has been put into making this a very complete and user friendly kit. Close up of the letter and SD card. Here is the contents of the kit after everything was unpacked. Another picture after some further unboxing, all of the white pieces on the right are printed parts. It’s pretty cool to see how many parts the machine can actually self print. 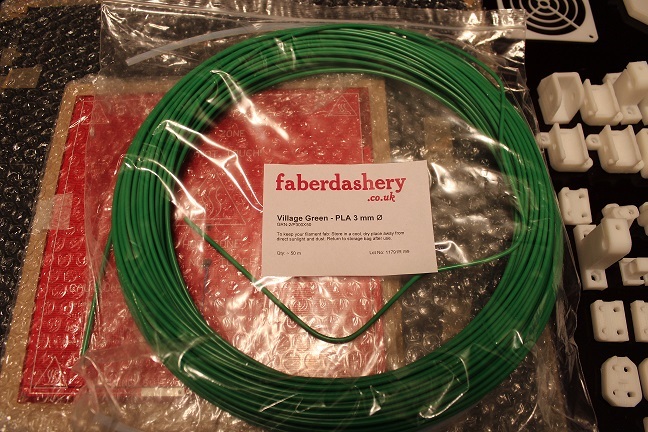 The kit even includes 20 meters of Village Green 3mm PLA filament from Faberdashery! Nophead recommends degreasing all of the metal parts that come with the kit since many of them are packed in oil or coated in oil from the machining process. Failing to remove the oil can prevent the printed clamps from grabbing onto the smooth rods. The first steps in the kit involve building the frame using the dibond sheets. The frame went up fairly quickly and all of the pieces fit together very well. The design of the frame keeps the gantry perfectly in place. 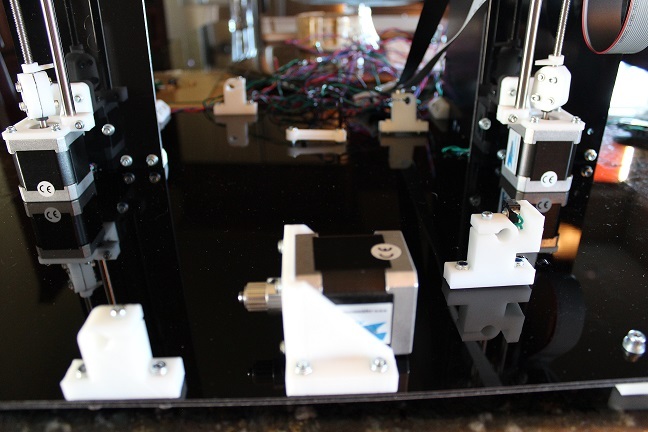 It starts to look more like a printer once the Z and Y axis motors are mounted. The mess of wiring in the background is all of the motor wires. The X idler bearings snap into place with a very tight fit. 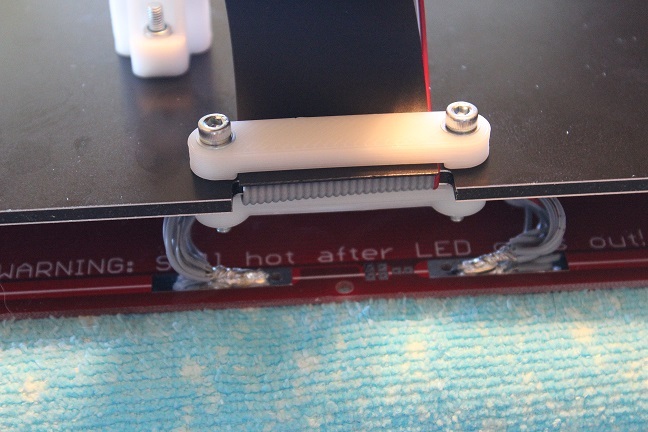 Putting together the hotbed involves separating the individual wires in the ribbon cable and soldering them together to supply current to the bed. I used a pair of wire cutters to make small cuts between each of the wires in the cable to make separating them easier. 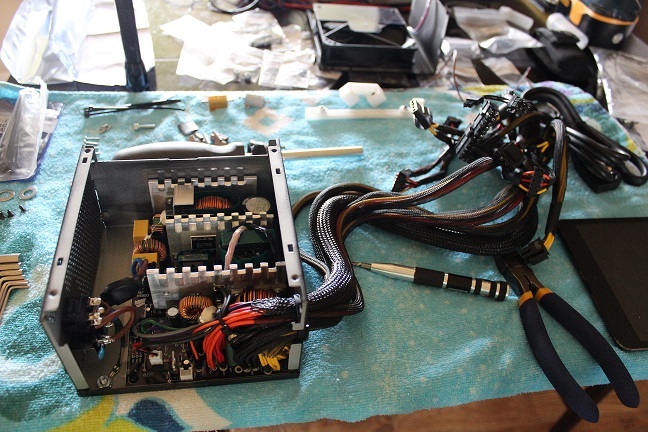 Removing the insulation from each of the strands of the ribbon cable was a fairly tedious process. I took my time with this step since I didn’t want to accidently cut through one of the wires and be forced to start over. Soldering the wires to the bed wasn’t too difficult especially after tinning the bundle of wires as Nophead suggests. Here is what the completed Prusa MK2 Headbed assembly looks like. Nophead’s kit even includes the glass plate which will later be clamped to the top of the bed. Mounting the hotbed on the y axis was fairly trivial, the hardest part was getting the belt properly twisted so it would sit properly on the idler. 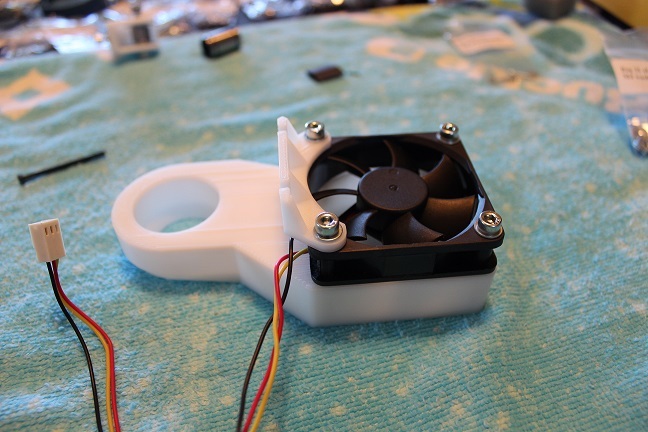 The X carriage fan assembly is a nice inclusion in this kit. Eventually I plan to add a bed fan for extra cooling. The X motor assembly required quite a bit of work with the ribbon cable which took quite a bit of time. 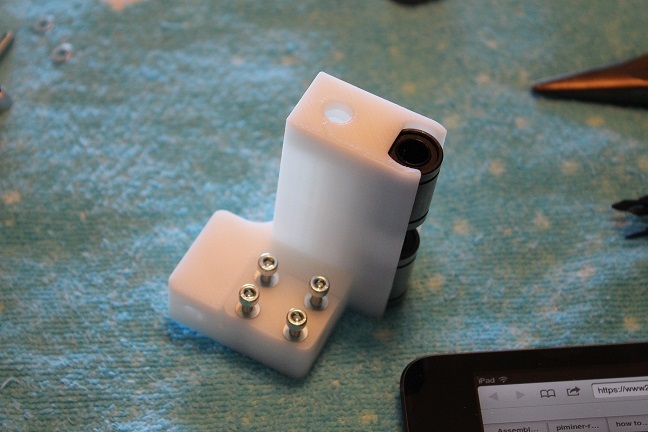 Putting the extruder assembly together was both fun and challenging. 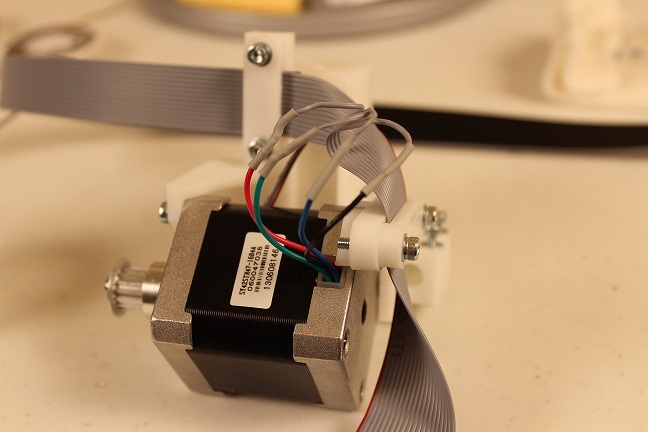 I made a mistake while soldering the connectors on the PCB assembly for the extruder motor and accidently oriented the fan connector upside down which resulted in the fan not working during the testing phase. This was easily corrected but I had to remove the motor assembly and the circuit board to fix it. It took me a while to finish putting together the rest of the extruder assembly mostly because I had trouble with Wade’s block. I managed to strip one of the nut traps in the motor block while tightening the screws on the idler block. The springs are under quite a bit of tension and I think I may have cross threaded one of them causing the nut to eventually spin inside the trap. I was able to squeeze a pair of needle nose pliers into the nut trap to hold it in place while tightening it. I haven’t had any trouble with it since then but I suspect that if I ever need to remove the idler block it will be an issue again. I printed a spare motor block as soon as I finished my build just in case I need to replace it. 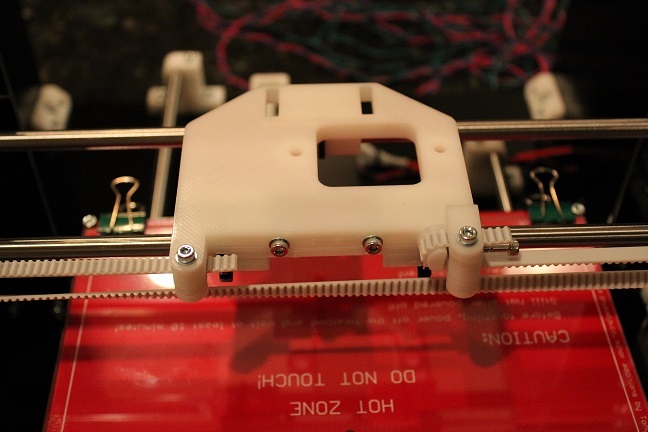 As with the belt for the Y axis the X axis belt requires careful placement to ensure it sits on the X idler properly. 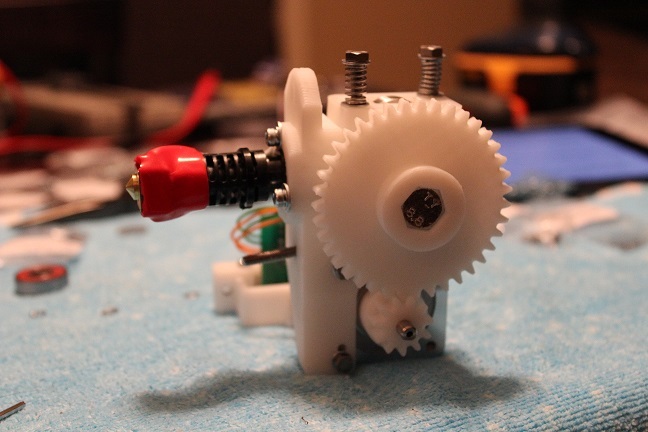 Here’s a closer look at the extruder gears after the assembly was mounted on the X carriage. 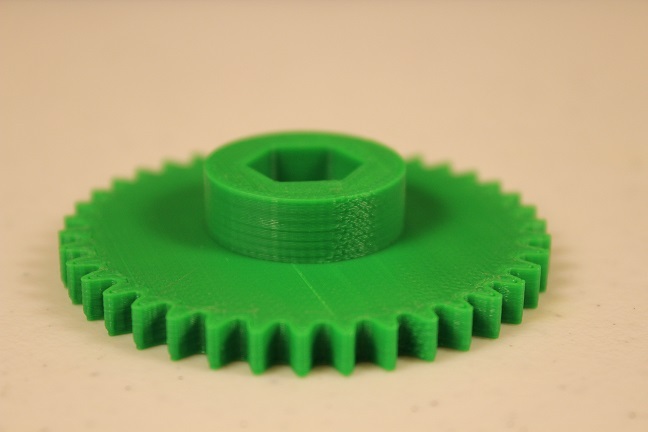 Since the gears are subject to wear I printed a spare set of them to have on hand incase one breaks in the future. Since Nophead doesn’t include a power supply in his USA kits I needed to purchase one. Originally I had planned to buy the same power supply Nophead uses since he has very detailed wiring instructions in the manual. The power supply he uses is an Alpine ATX500 which isn’t readily available in the US. While I did find a seller on eBay who was selling the exact same power supply I decided against ordering it since the estimated shipping time was ~10 days and I was anxious to get started before then. I ended up spending quite a bit of time researching which power supply to buy since I wanted to make sure it met the requirements of the Mendel90. 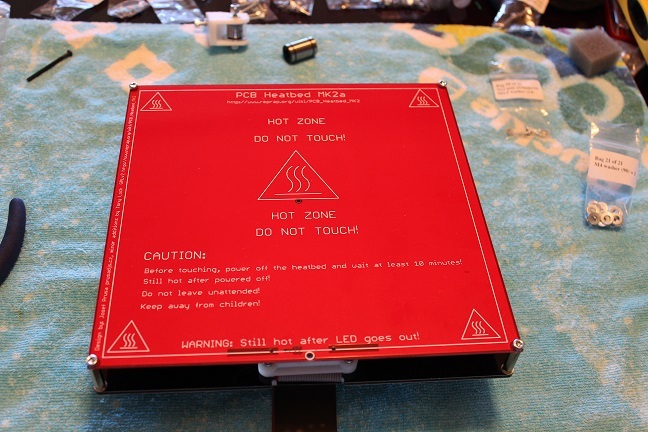 The printer runs off of 12 volts so the most important quality in a power supply is having a single 12V rail that can provide plenty of amperage for the heated bed and the hotend. After reading several forum posts and comparing my options I ordered the Corsair Builder Series CX600 600 watt power supply. This model has a single dedicated 12 volt rail that provides 46 amps of current which has proved to be plenty of power for the Mendel90. It’s also a non modular power supply which is important since everything needed to be completely rewired. First I removed the power supply cover in order to cut the zip ties holding the cable sleeving in place. After removing all of the sleeving I cut off the heat shrink tubing near the connectors and then cut all of the connectors off. Once all of the connectors are removed the power supply looks very strange in its naked state. Fortunately Corsair was kind enough to label the PCB incase you forget what each of the colors represent. For the most part the colors matched the table provided in the manual except for the 3.3 volt sense wire which was a thin orange wire which is also labeled on the PCB for easy identification. I discovered pretty quickly that this power supply was larger than the one Nophead uses and as a result it wasn’t going to fit in the ATX power supply bracket included with the kit. With this in mind I decided to leave more length on the cables than called for in the manual so I can have more mounting options later. As Nophead mentioned to another builder in the forums more expensive power supplies usually use thicker gauge wire which can make it harder to fit all of them within the small terminals on the Melzi board. I plan to build a wiring harness of some sort to provide an intermediate connection point instead of going directly from the PSU to the Melzi terminals. Initially I wired up the power supply using the load resistors supplied in the kit but when I would turn on the power supply the fan would briefly spin up then the power supply would shut off. Once I removed the load resistors it started to work as expected. 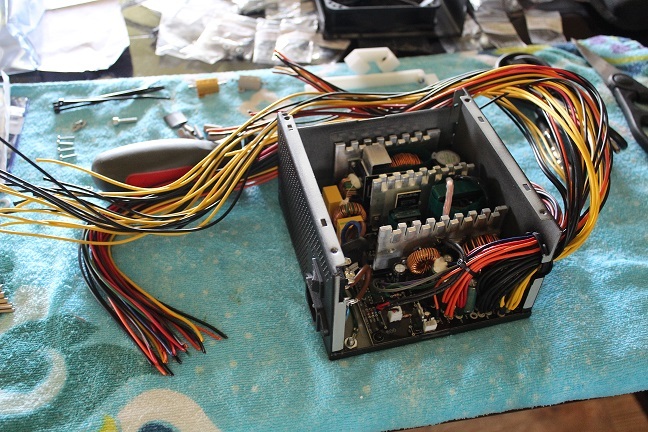 Essentially the only things necessary to get the CX600 working is to connect the green PSU-ON wire to one of the black ground wires, and also connect the small orange 3.3 volt sense wire to one of the regular sized orange 3.3 volt wires. After those changes were completed the power supply powered on and stay on once the switch was flipped. My Fluke meter read a steady 12.47 volts on the 12 volt rail. 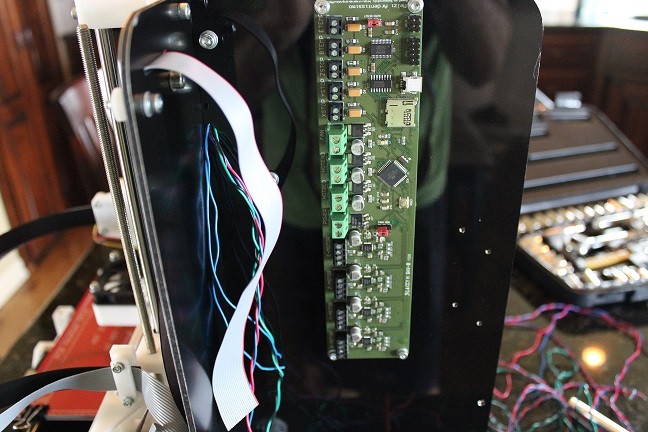 Once all of the components are in place the Melzi board can finally be installed. Each of the terminals are labeled so the main concern is just making sure the polarity is correct. Nophead recommends using a multimeter to check the resistance on the thermisters as well as the motors to ensure there are no obvious issues before connecting the wires to the terminals. The Melzi board has a built in SD card reader which allows you to run print jobs without having to keep the printer connected to a computer. As expected I wasn’t able to fit either the bundle of 12 volt or ground wires into the Melzi terminals. As a temporary workaround I installed a thin wire in each of the terminals and used a pair of alligator clips to connect them to the larger bundles coming from the PSU. Once I figure out exactly how I wan’t to handle the power supply I’ll put together a cleaner solution. I also decided against trimming the 5V and 3V bundles for now since I may want to use them to power some other devices such as a Raspberry Pi. 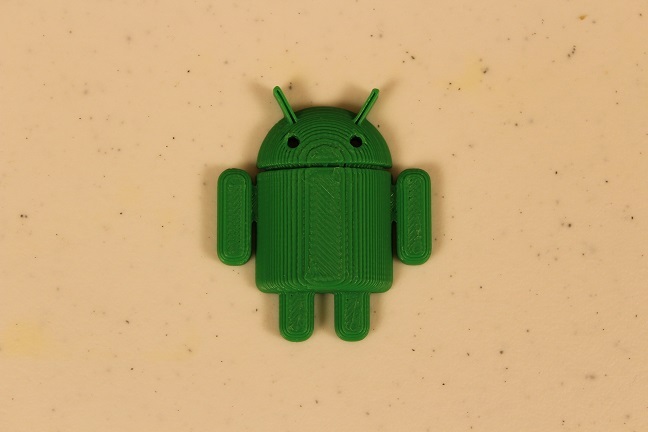 For my first print I used the sample Android g-code file Nophead provided on the SD card. The first run created a mess of spaghetti, it was fairly obvious that the nozzle was too high above the bed. After a slight adjustment to the Z height in the firmware the Android turned out great! 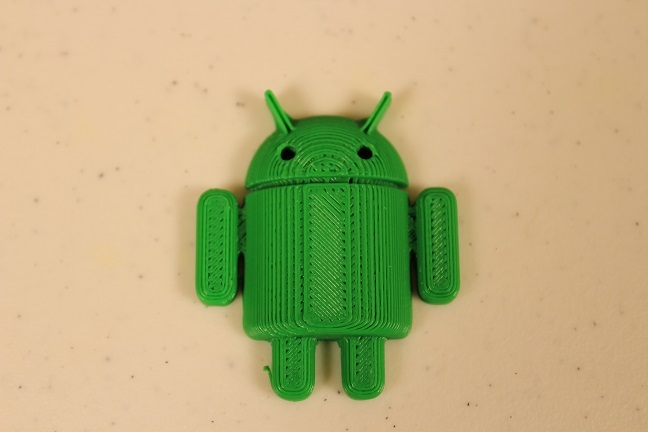 The Android sample included is sliced at .2mm. Overall the quality was very good but as you can see from the photo below it is a bit under extruded. Here is the same print after performing the extruder calibration procedure defined in the manual. The gaps near the edges were nearly reduced. I think it could still stand to use a bit more fine tuning. I wanted to get some spare parts printed out as soon as possible so my next print was Wade’s Big Gear. This print turned out really well especially considering it’s only the second print from the machine! Before purchasing this printer I had a misconception that ABS was stronger than PLA. This lead me to wonder if it was even worth bothering to print spare parts out of PLA if they wouldn’t be strong enough as their ABS versions. As it turns out PLA is actually stronger than ABS, although PLA is more brittle. 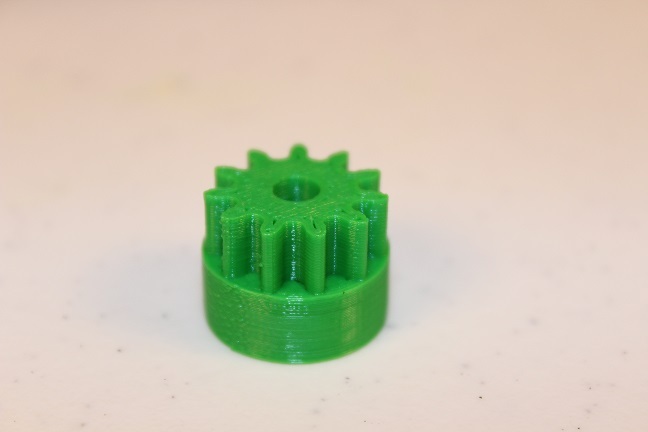 I followed up by printing Wade’s Small Gear. Overall I’ve been very impressed with Nophead’s design of the Mendel90 as well as the kit he has prepared. The design of the printer speaks for itself with the high quality of the prints I was able to produce after only about 20 minutes of calibration. 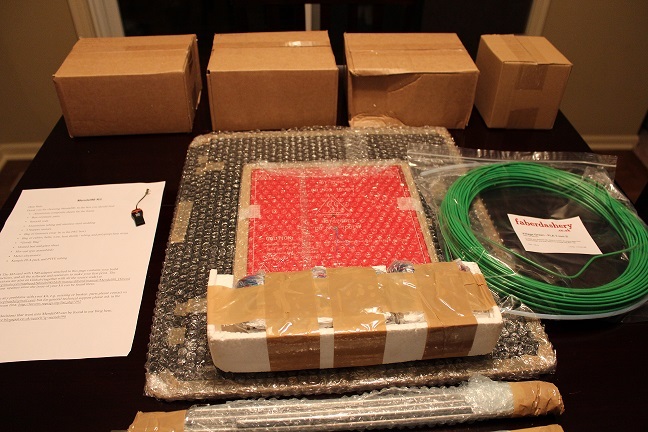 Nophead’s kit is a very complete kit, he includes many small details in the kit that make a big difference such as the SD card, sample of PLA filament, and all of the settings for the software. These details made the kit very fun to build while still providing several challenges to overcome along the way. There were a few parts of the build that took me a bit longer than expected but at no point during the build did the process become frustrating. Instead the kit provided a very rewarding and enjoyable build experience. 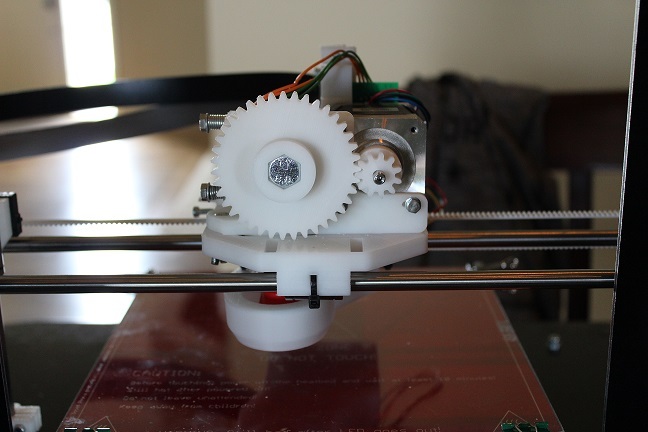 If you’re looking for a great 3D printer to build I highly recommend building a Mendel90. Just ordered one myself, in large part because of this and other reviews that were so positive about the kit and build. One question: What do you mean the power supply didn’t fit? I thought the PSU’s were standard size of 86mmx150mmx140mm? I also am in the US and need to pick up a powersupply so any thoughts on this would be great. Thanks. Thank you very much for sharing your experiences with us. I’m currently at step one of your journey: Deciding between a Prusa i3 and the Mendel90. The Mendel90 seems to be the obvious choice, both from the quality of the kit and the quality of the results. The prusa kit on the other hand is around 200€/250$ cheaper. As I’m just not sure if I’ll keep printing stuff I’m thinking about starting with a smaller invest. Are you still printing stuff or is your Mendel already collecting dust? Just getting started. Bought 3D printing for dummies as a starter and learned a lot; the book had a much good stuff to say about the Mendel90. 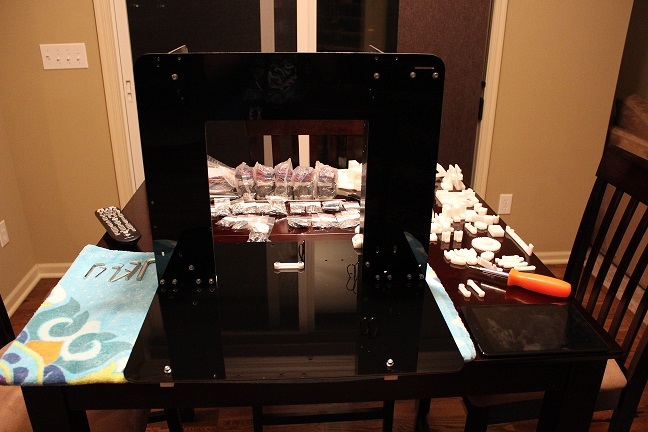 I found your paper on the internet about your experiences building this 3D printer, and was very impressed. I am looking at other printers but yours has my #1 vote. Is everything still working as you expected? What have you printed that just Wowed you? What are some of your goals for using the printer? : I would like to make some money with mine. Merry Christmas form Texas. Nice write-up, Sam, only just seen it. My metric dial gauge is also too short but I was able to unscrew the tip and replace it with an M3 screw. Your X belt is actually twisted the wrong way. The teeth should face inwards, away from the fan. Not a problem unless they catch. The PSU would probably have worked with the load resistors when connected to the Melzi to give a bit of load on the 12V. If not it would also need a load resistor on 12V. Without load resistors you might find the 12V drops excessively when the bed is on. The android is actually sliced at 0.3mm. It looks a lot better at 0.2mm but requires more accurate Z calibration, so not as easy for a first print. 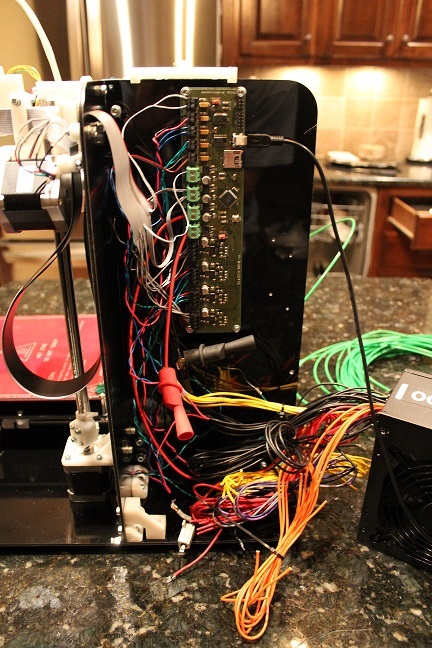 Thanks, super helpful writeup as I try to determine what DIY 3d printer to start with. Appreciate your detailed walkthrough and photos.